A blend of some fifty exceptional and fully matured eaux-de-vie produced exclusively from Grande Champagne grapes. This blend was created in 1888 to celebrate the winegrowers' triumph over the Great French Wine Blight, which decimated European vineyards. Triomphe is an ode to the passage of time that preserves the excitement of new beginnings. It is a liquid illustration of Proust's In Search of Lost Time, particularly its final volume Time Regained. An initial sip invokes a respectful silence, like a cue to take your seats at the theatre. The opening is timorous and silken with delicate suggestions of white cedar and fresh vanilla leading into a more intense palate of liquorice, chocolate and mild spices. The fruits rally in a languorous finale of caramelised apples and plums, prolonging the last delicious mouthful almost indefinitely. 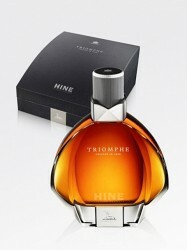 Triomphe is an undulating rhythm. Listen closely enough and you can almost hear Nina Simone’s melancholic voice flanked by piano and percussion.